Monica Abbott is inspiring on many levels. She is an Olympian. A professional athlete. A local girl made good. Most impressive is her commitment to give back to local female student athletes through academic scholarships. 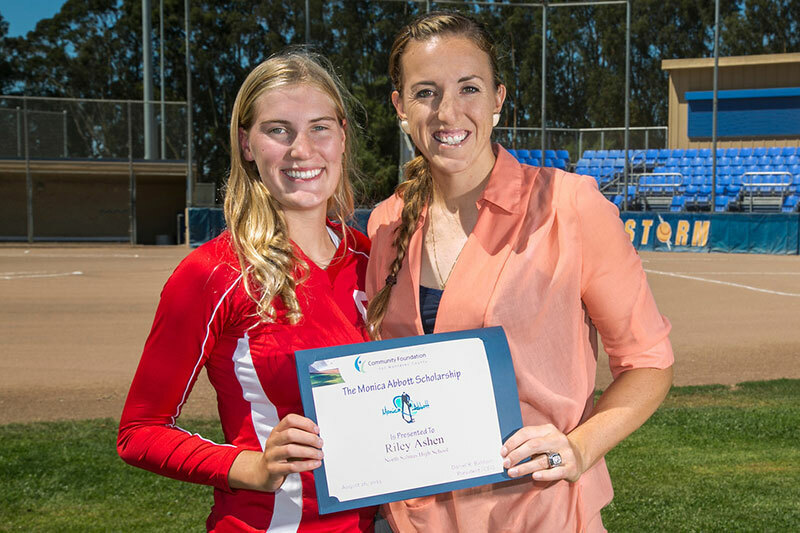 Her generous spirit shone through as she met with the first two recipients of the Monica Abbott Scholarship Fund. Monica felt the support of local fans that followed her softball career on the sports pages from North Salinas High School through the University of Tennessee, as a medalist at the 2008 Olympics and member of the two-time world champion USA National Team. She played professionally with the Toyota Motor Corporation in the Japan Softball League and for the champion Chicago Bandits in the National Pro Fastpitch league where she is three-time Pitcher of the Year. In May 2016, the Houston-based Scrap Yard Dawgs, one of the newest teams in the National Pro Fastpitch league, signed Monica to a six-year, $1 million deal — believed to be the highest salary paid by a professional women’s sports team in the United States. In her spare time, she travels the country putting on clinics and doing motivational speaking. “I was looking for a way to give back to my hometown in a permanent, personal way. I thought one of the best ways would be through establishing a scholarship. Education can help a lot of these kids. I worked my entire life and the only way I could go to college was through a scholarship,” said Monica. “It’s important to me not just that they (recipients) play a sport or have a good GPA, but that they show dedication and drive to their sport and community. I wanted to give someone a step up, a little help,” she added. Monica was referred to the CFMC by her professional advisor, Steve Merrill of Monterey Private Wealth Management. She established the Monica Abbott Scholarship Fund in 2012. Riley Ashen of North Salinas High School and Cassandra Zazueta of Everett Alvarez High School were the first recipients. Monica was able to meet and encourage them one week prior to their departure for their freshman year at Sacramento State University. Each received $1,000. In 2014 all public Monterey County High Schools will be invited to nominate an applicant. Monica’s vision is to grow the fund and ultimately provide full scholarships. At age 28 she is the youngest person to ever create a fund at the CFMC. She is an inspiration by any measure.